– Corona, please, but hold the lime | brainsnorts inc. There were some great friends with whom I used to hang out, but unfortunately I haven’t seen them in more than a year. One of them would unintentionally make me laugh when she’d order a Corona Light, take the lime wedge, jam it into the bottle, turn it upside down for a while, and then drink. When I asked what that was all about, she very confidently explained the “correct” procedure and reason for the lime in the Corona. I laughed because she looked silly, but I let her have fun. Allow me to elucidate. The lime in the Corona has absolutely nothing to do with taste. It’s not a secret formula to improve or enhance the beer’s flavor. It’s not interacting with dormant hops to then explode with hidden flavor. Here’s a simple explanation for the citrus on top. Corona is from Mexico. In Mexico there are many flies. Here too, of course. 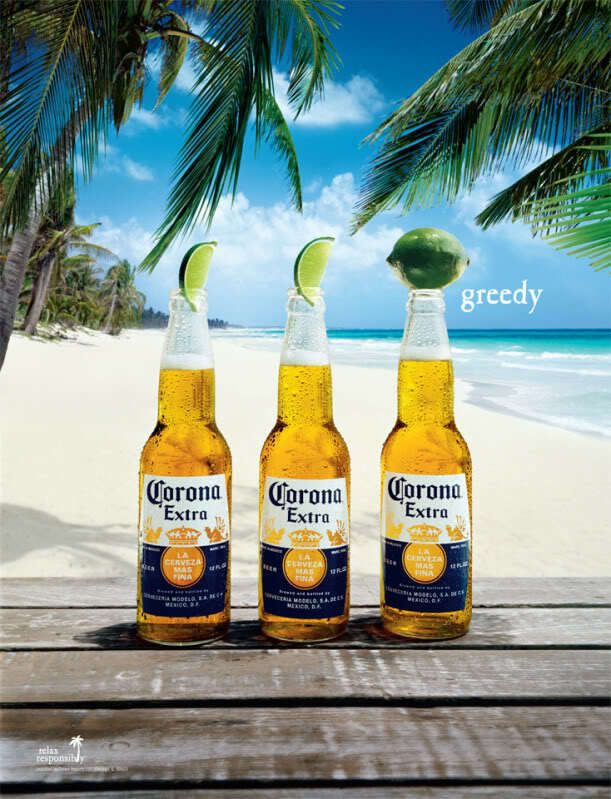 Corona, as you can see from the picture above and those beautiful commercials on the beach, seems to spend a lot of time outside. Flies are outside. Flies are attracted to the beer. The lime is simply there to keep the flies away from the bottle. Why a lime? The green is a better complement to the color of the beer than a lemon would provide. August 2, 2010 in Corona beer, flies, lime. Wow! I’ve seen men do this. Now I know why! Thanks. Yes, the couple times I tried Corona, the lime didn’t help me get over the awful taste! Then again I hate beer in general.